We fixed the AC, initially with one of those cheap refill cans. Later on I got it fixed properly with gauges and evacuating the system with another friend. My friend rewired the rat's nest of wiring and made the audio system functional again. He also figured out some of the excess wiring and we were able to clean that up considerably. We replaced the speed sensor, which didn't fix the speedo issue unfortunately. However, the speedo started working again today for some reason, so I guess that's sorta fixed now. 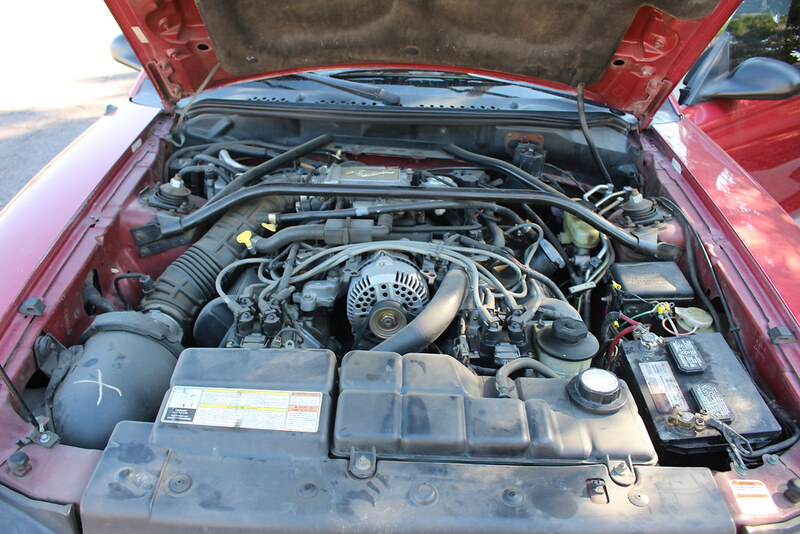 The coolant issue was fixed by adding coolant and replacing the coolant reservoir cap, as those are known to go bad. A new PCV + hoses fixed the smoking issue, and a new idle control valve fixed the stalling issue with the AC on. All of those parts were bought dirt-cheap at Autozone, which is something I'm very proud of (good luck buying BMW parts in a store on a Sunday afternoon!). The braking feel was much improved after bleeding the brakes and replacing all the brake fluid with fresh stuff. A quick junkyard run yielded some useful interior bits, nicer condition wheel center caps, a cool bumper lip (haven't installed yet), and a perfect condition front right corner light to replace the taped-together existing one. No real damage, just the side skirts got torn off. My friend saved the clips and side skirts so those will go back on at some point. I actually looked at the side skirts yesterday on my front porch, but the black widow spider didn't want to give them to me so those might stay off for a bit longer. After decreasing property values in that part of LA with my hooptie, I drove to Malibu to experience some driving bliss. Getting there sucked though, because LA somehow managed to have stop-and-go traffic on a Saturday afternoon. 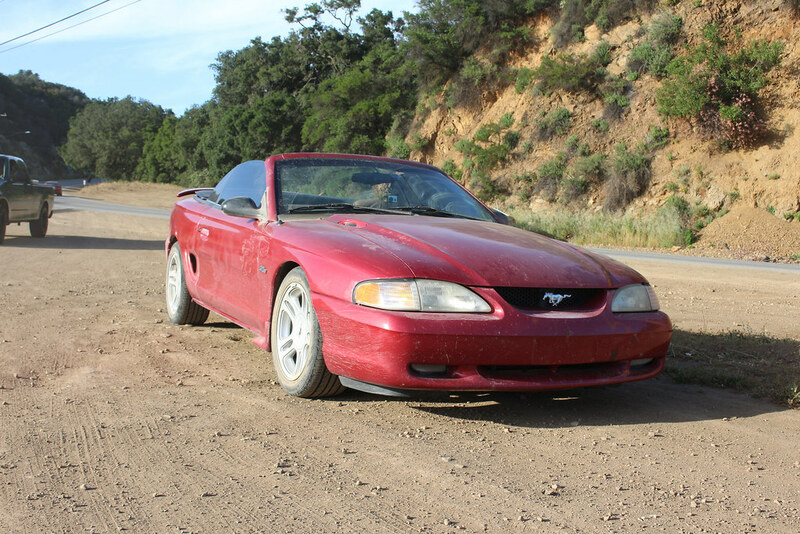 It was at that point that I realized the Mustang had a fully manual, heavy, unassisted clutch. That took a little time to get used to, since I'm used to the relatively light hydraulic clutches on BMW's. Eventually I made it there and had a total blast at Kanan Dume road in the canyons of Malibu. If you've watched Matt Farah's one take videos, that's where he films most of his videos. Speaking of that, Matt Farah did a video with the Mustang, which you can see here: https://www.youtube.com/watch?v=L35efXNbH2k. Surprisingly, he enjoyed it. Anyways, I drove the Mustang around Malibu a bunch and had a total blast. Lot of tunnels to make noises in, along with beautiful, sweeping views all around. The Mustang was pretty filthy at this point, but I didn't care. After that, I got stuck in another hour of stop-and-go traffic, this time going up a hill. Just in case I needed another reminder of why I don't want to live in LA... The best part was that there was a 911 C4 convertible ahead of me, and I definitely made the driver mad with all the noises from my Mustang. That provided a humorous break from the traffic though, so I ain't mad. The drive home to Phoenix was pretty uneventful, aside from me needing to wear earplugs to avoid developing tinnitus from the exhaust and poorly sealed top. The speedometer still didn't work at that point so I used a GPS speedometer on my phone to figure out roughly what speeds I was going at based on the gear I was in and the RPMs (like 2000 in 5th was around 70mph). I made it home without any problems, so I guess the Mustang is secretly a decent car on the inside, despite its rough external appearance. A few days later, I was going to a gas station and noticed a squeaking sound coming from my wheel. Thinking it was a wheel bearing gone bad, I didn't pay much attention. Then when I got to the gas station I noticed the wheel was sitting crooked and it was very loose, yikes! 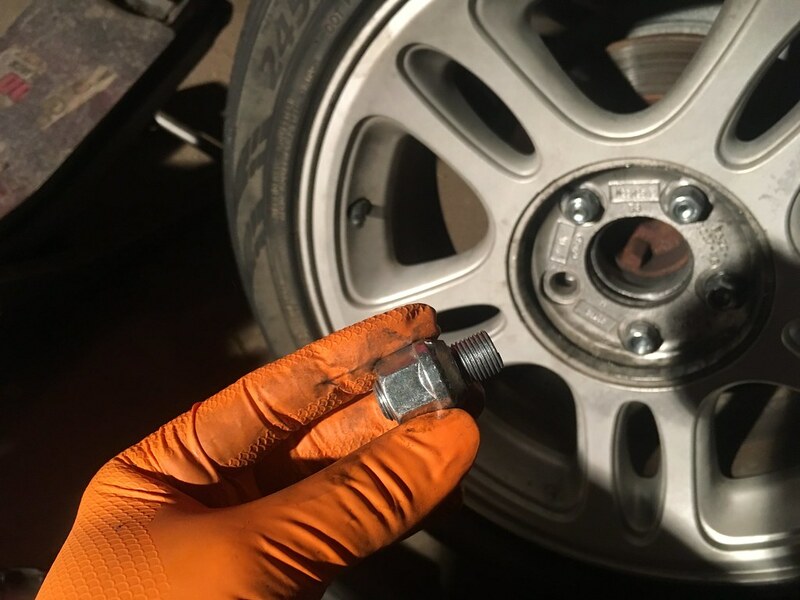 I limped the Mustang home slowly and once I was safely in my driveway I took off the wheel to find that the el cheapo eBay wheel spacers had vibrated the lug nuts apart along with breaking one of the wheel studs. Lovely. Don't buy garbage spacers, kids! I'm super thankful that this didn't happen on the drive home, that would have been reaaaal bad. 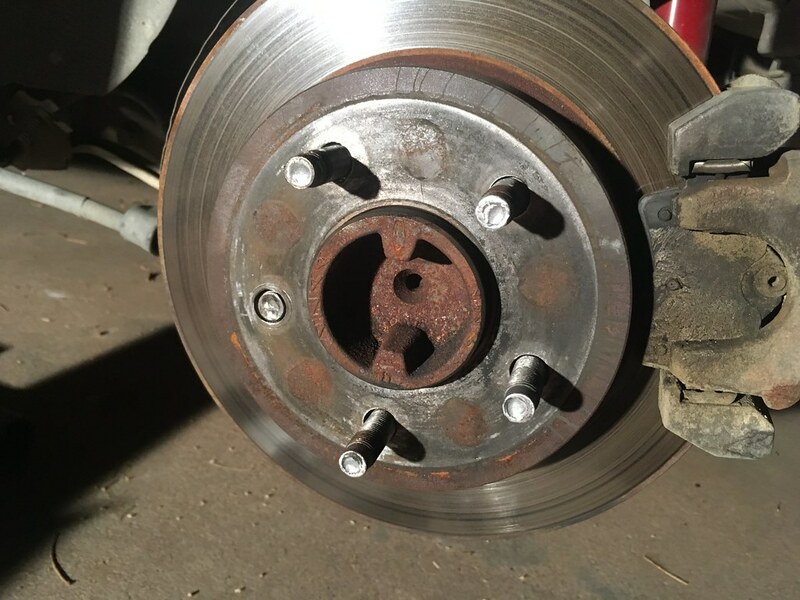 I replaced the broken wheel studs after a considerable amount of hammering and swearing. Eventually I'll get some better spacers or maybe a wider set of wheels... the 235's in the rear have almost no grip. The engine isn't even that powerful in stock form (215hp/285tq) but I can still spin the rear tires in the first three gears. That just about brings me to the current day, phew. That was a lot of writing. 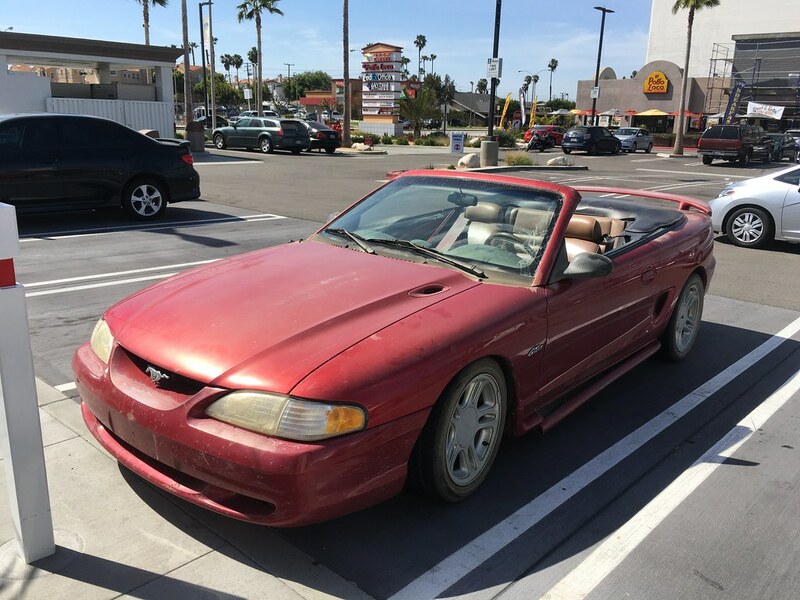 tl;dr: I bought a cheap Mustang that somehow survived a trip to and from LA. 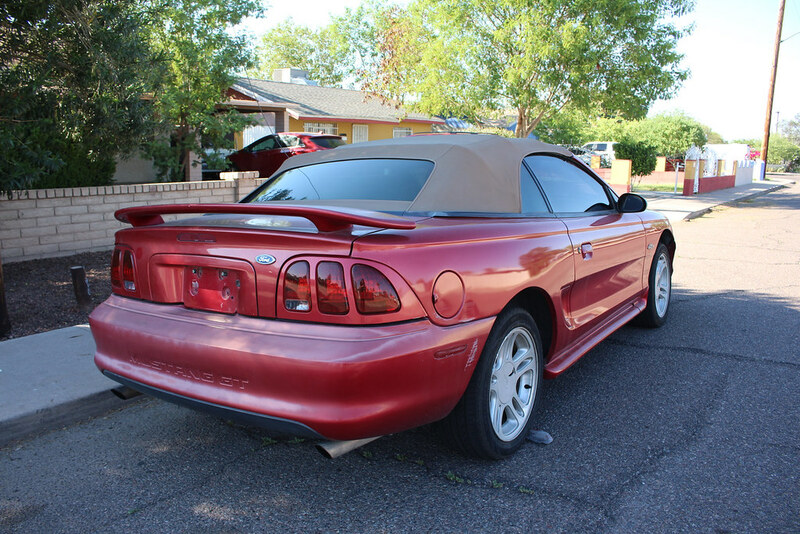 Since my fleet of German cars take up a lot of my disposable income, I'm trying to do this Mustang project on a budget. I'm aware that it's cheap enough to be a challenge car, but I'd rather take it easy and keep the car mostly intact while I learn what I'm doing as a driver. I've never owned a car with a solid rear axle before, so that'll be an interesting learning experience. I basically want to build this Mustang into something that I can take to the track without risking the cars that I actually care about. I know I'm at a disadvantage since it's a convertible, but I like the convertible form factor and it's what I already have, so I'm going to work with it. Eventually I'll need to get a roll bar made, so it'll be a good time to learn how to weld. I'm not about to pay somebody to fabricate one for me, so I'm gonna trust my own abilities for better or worse. After that I'll weld in some subframe reinforcement bars, those will help a lot with the limp-noodle SN-95 chassis. 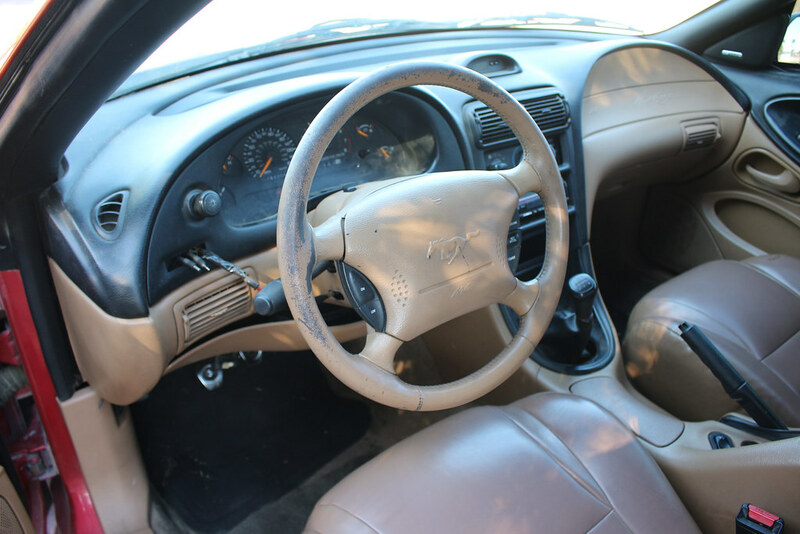 In the immediate future I'll be getting a Steeda Tri-Ax short shifter kit and 4.10 rear gears. The short shifter will make the shifts feel a lot better, whereas right now it's extremely vague and hard to tell what gear it's in— not ideal for any kind of performance driving. The rear gears will help me launch better and do better burnouts (there will be plenty of burnouts). The short shifter should be an easy install, but the gears will be a little trickier. Oh well, I've always wanted to learn how to put together a diff, so now's a good time to learn. At some point once I have the suspension and brakes more dialed in, I'll start looking at upgrading the 4.6L modular engine. 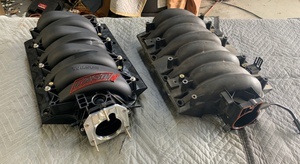 In stock form it's pretty underpowered at 215hp and 285tq, but with the PI (performance improved) heads/intake/cams from a 1999-2004 Mustang, I'll be able to push the power to 260hp and 302tq. If I throw in some hotter Comp cams, a bigger throttle body, underdrive pulleys, and a tune to optimize for 91 octane, I can probably get it closer to 300hp, which would be a nice amount of power. These engines take really well to boost, so I might add a nitrous system or a cheap junkyard supercharger for more power. The best part about this car is that it's not my daily driver, so I can afford to be stupid with it. Later this month I intend to take it to the drag strip, they have open track nights on Fridays where anybody can come and race their car. That'll give me a good baseline on the performance with the car in its present, near-stock form. I love some Mustang beater action, but for heaven's sake, stop it with the sketchy mods. You can get cheap lowering springs from places like American Muscle instead of cutting springs, for instance. For rigidity, look into some chassis braces from BMR or something. You don't necessarily need a roll cage, unless you're planning on doing track days. Sky_Render wrote: I love some Mustang beater action, but for heaven's sake, stop it with the sketchy mods. You can get cheap lowering springs from places like American Muscle instead of cutting springs, for instance. For rigidity, look into some chassis braces from BMR or something. 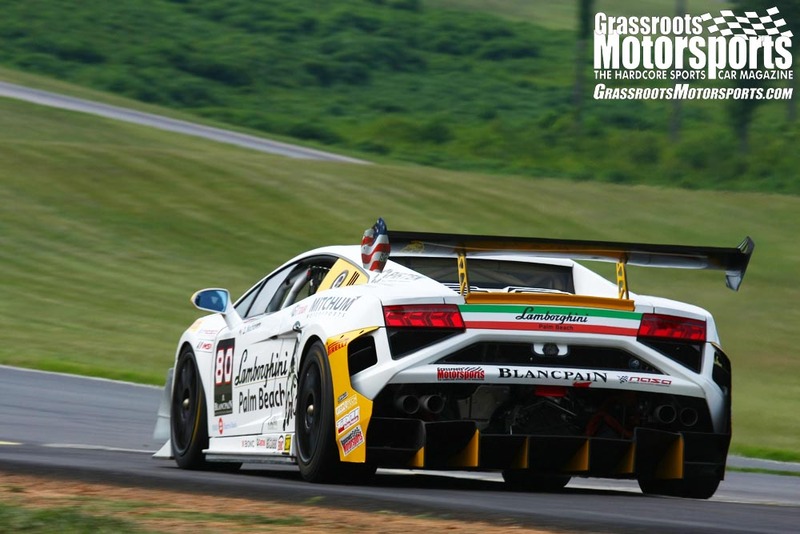 You don't necessarily need a roll cage, unless you're planning on doing track days. Haha, I totally get that. The sketchy mods were more for comedy value since we were filming the whole initial build in my garage for my friend's YouTube channel. I do plan to get proper lowering springs because the car bottoms out almost everywhere, and it scrapes on almost everything due to the subframe being the lowest point on the car (better than scraping the oil pan, I guess). 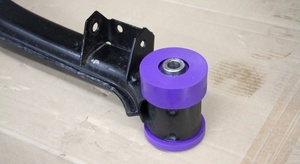 I was looking at the subframe braces from Maximum Motorsports, they have the full-length subframe connectors that are highly rated so I'll likely go with those. I can get away without a roll bar for a little bit. I'll mostly be drag racing with maybe a handful of autocross here and there, so I'm kinda sticking to NHRA rules— anything faster than 13.99 requires a roll bar in a convertible. Given that a stock SN-95 Mustang has an ET in the 15's, I have a bit of time before I have to start installing any serious safety equipment. Once I pass that 13.99 mark, I'll need to install a roll bar, get a proper helmet, a proper 5-point harness, etc. And if I get slicks I'll need a driveshaft safety loop too. 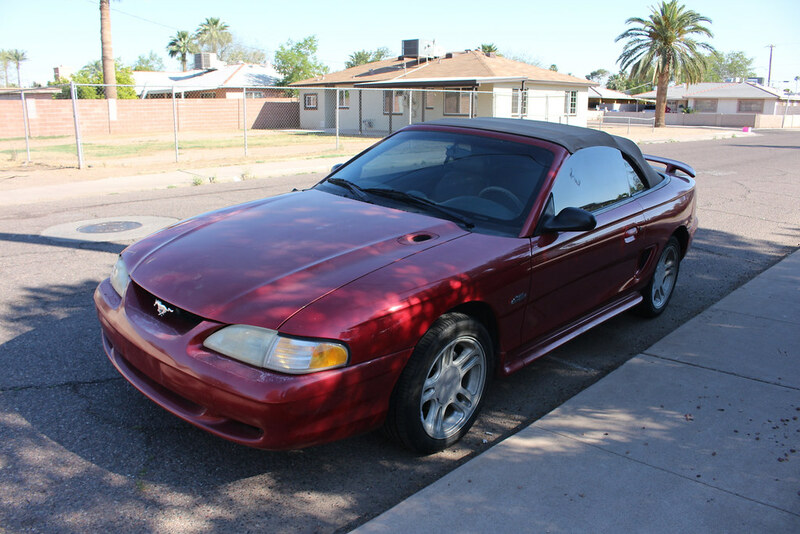 I was looking at maximum motorsport's site out of curiosity when my sister got her '97 GT convertible. 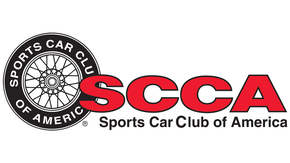 I think it specifically says their SFCs don't work on convertibles. I haven't spent enough time under Mustangs to know why or why not. Either way, I look forward to seeing where this goes. Convertibles generally have additional bracing under the car to make up for the lack of rigidity caused by chopping the roof off. Call BMR or Maximum Motorsports to ask. They're both very helpful. Chadeux wrote: In reply to dannyzabolotny: I was looking at maximum motorsport's site out of curiosity when my sister got her '97 GT convertible. 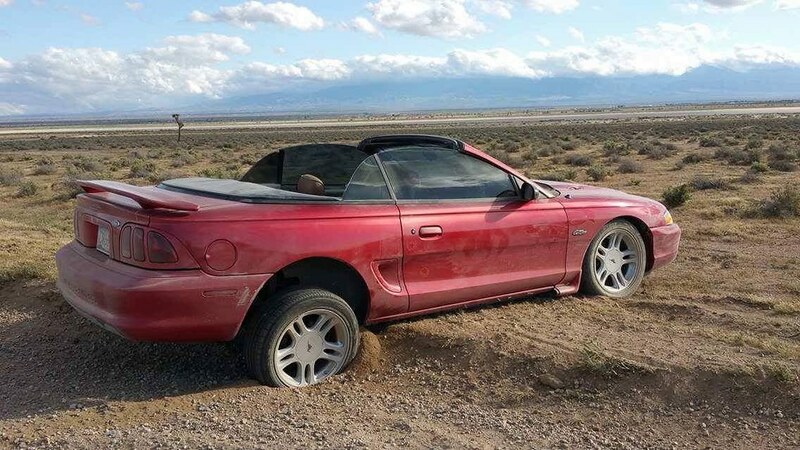 I think it specifically says their SFCs don't work on convertibles. I haven't spent enough time under Mustangs to know why or why not. Either way, I look forward to seeing where this goes. Mods aside, the next thing I'm gonna do is fix the convertible top. It's visibly crooked on one side when opening and closing so there's probably something I have to adjust. The top is so misaligned that closing it requires a bit of extra force and the driver's side window doesn't seal fully which means lots of extra road noise. Just kidding. Nothing quite like a beater mustang GT, hoping to get one myself soon. How are you liking the Non-PI heads? Txsilverbalt wrote: Hello Tavarish. Just kidding. Nothing quite like a beater mustang GT, hoping to get one myself soon. How are you liking the Non-PI heads? 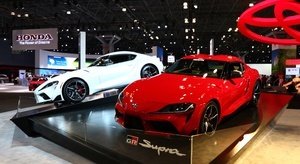 Funny you mention Tavarish, I built this car with him— he's a good friend of mine. He flew out to my house in Phoenix, we worked on the car for a weekend, and then he drove it out to LA to thrash it with Chris from B Is For Build. 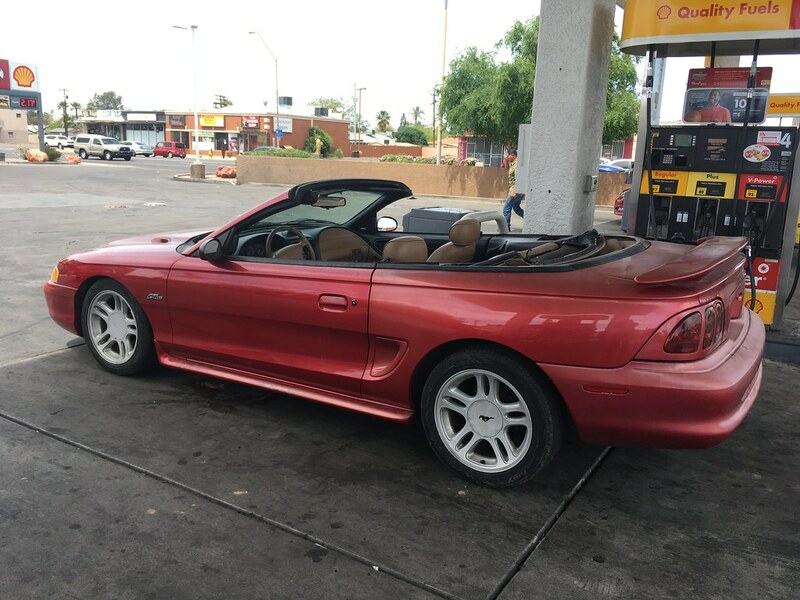 Then I took a bus to LA and drove the Mustang home. For a $1000 beater, it's been exceedingly reliable, making it to LA and back with no issues. There's no rust anywhere either, so it's a pretty good starting point for a project. The non-PI heads definitely choke the motor in the upper end, but I wouldn't call the Mustang slow by any means. 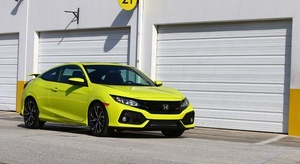 It has a 0-60 time in the mid-6 second range and runs a quarter mile in the low 15's stock. 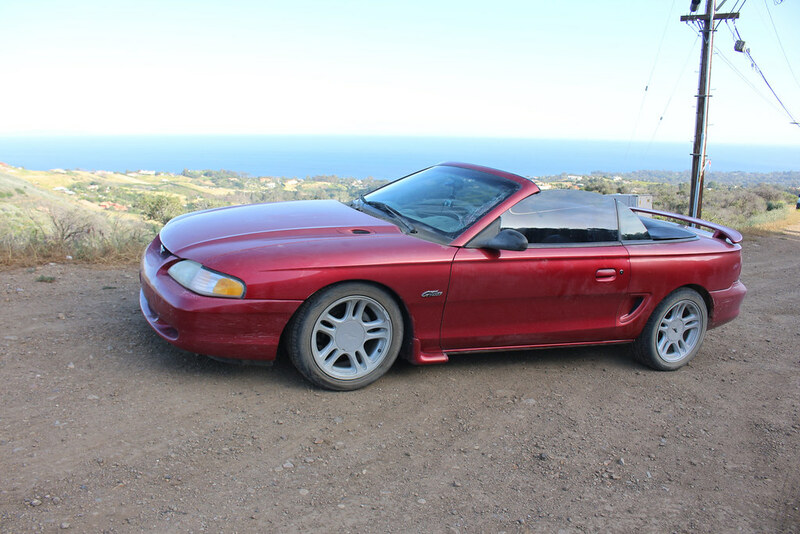 We truly live in a great time when $1000 buys a RWD V8 convertible with an LSD and a manual, with reliable fuel injection and AC to boot. I'm curious to see what this motor will put out with some ported PI heads and hotter cams on a 91 tune. I will definitely be following this build with interest. Thanks for the tip! I'm still pretty new to the American car world, so I'm still trying to figure out what I'm doing, haha! I'm used to cars with DOHC V8's that have insanely complicated timing chain systems and variable valve timing and water-cooled alternators, so the 4.6L modular almost seems like child's play. And the price of that manifold is super reasonable too! I was honestly expecting it to be closer to $1k— I'm used to BMW part pricing, where a rebuilt alternator is $300 at the cheapest. I've been lead to believe the best modular Ford intakes have drive belts. Chadeux wrote: I've been lead to believe the best modular Ford intakes have drive belts. Haha, are you hinting at a supercharger? That's way beyond my budget, though I might try to cobble together something with a junkyard Eaton M112 blower, it's the same one that the later model year Cobras used. Otherwise I'm just going to stick to cheaper methods of getting power, like nitrous. I seem to remember a not that expensive intake manifold that let you put the M112 onto a 4.6 2V. The off the shelf Ford supercharger manifolds don't work on the 2V. The Cobras had 4V heads and the Lightnings had 5.4 2Vs with a taller deck height, so while the heads are largely the same they are farther apart, meaning the intake won't fit the 4.6. I guess I don't have to mention the GT's 5.4 4V. Chadeux wrote: In reply to dannyzabolotny: I seem to remember a not that expensive intake manifold that let you put the M112 onto a 4.6 2V. The off the shelf Ford supercharger manifolds don't work on the 2V. The Cobras had 4V heads and the Lightnings had 5.4 2Vs with a taller deck height, so while the heads are largely the same they are farther apart, meaning the intake won't fit the 4.6. I guess I don't have to mention the GT's 5.4 4V. 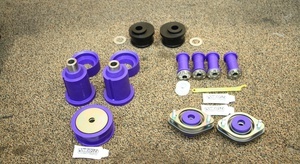 Tork Tech makes the kit but it's about $2500 without the supercharger. I guess the budget forced induction answer is a Chinese turbo then. In any case, I'd rather build the engine to be as good as it can be before I start throwing on juice and/or boost. Throwing a ton of extra power at an old, stock engine is never a good idea. In any case, while I am interested in drag racing, I'm not obsessed with getting to 10's or whatever. I want the power to be usable for other types of racing like autocross. All of the bolt ons! Any ideas for suspension, or are you going to keep the cut springs for as long as you can? Txsilverbalt wrote: In reply to dannyzabolotny: All of the bolt ons! Any ideas for suspension, or are you going to keep the cut springs for as long as you can? I definitely need to get caster-camber plates for the front, since lowering the car messed all of that up. Once I have the the car lowered properly and on wider wheels I'll probably want to look into something to keep the rear axle in place better— right now it can move around laterally quite a bit, which makes for some pretty sketchy handling. 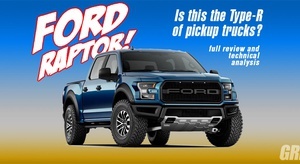 I think you should look for a wrecked 5.0-Coyote-powered F-150 in a junkyard and swap it in. Other than lower compression and cams/intake tuned for more low-end torque, it's essentially the same engine as the '11+ Mustangs! Sky_Render wrote: I think you should look for a wrecked 5.0-Coyote-powered F-150 in a junkyard and swap it in. Other than lower compression and cams/intake tuned for more low-end torque, it's essentially the same engine as the '11+ Mustangs! Not sure if there's room under the hood for a Coyote in an SN-95... Also, I don't want a Coyote. I already have my complex BMW DOHC V8's for when I want something more refined and high-revving. 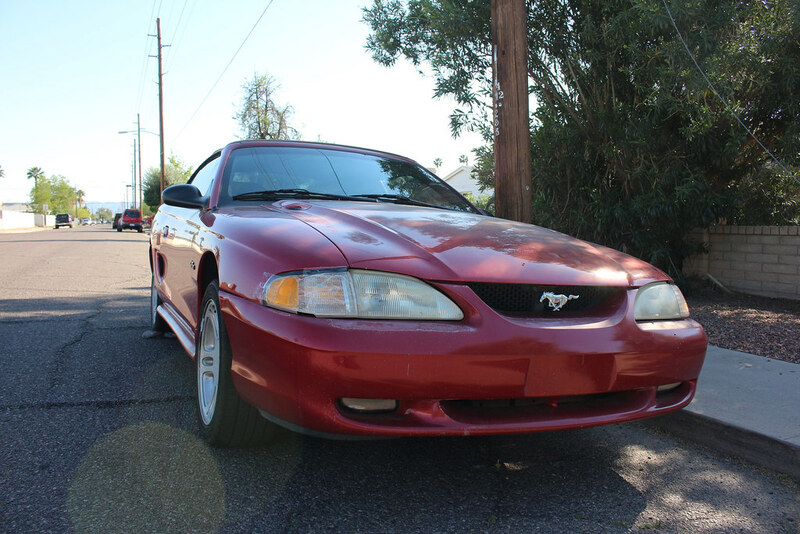 I want the Mustang to stay relatively simple so I can continue pounding on it and throwing Autozone parts at it. I like how simple the 4.6L modular engine is. If I were to do an engine swap I'd go more old school with a Ford big block, like a 429 or a 460. The older I get, the less I want to deal with computers and overly complicated engines. I think a 4.6 2v with bolt ons would be great for a track car or autocross. You're looking at slow drag car though. Chadeux wrote: I think a 4.6 2v with bolt ons would be great for a track car or autocross. You're looking at slow drag car though. I get what you're saying. I'm still gonna take it to the drag strip, but more for fun than to win competitions. 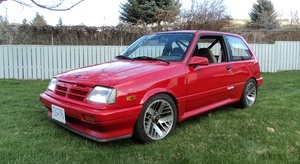 If I was building a dedicated drag car I'd just turbo a 5.0 fox body and gut it like every other Joe on the drag strip. 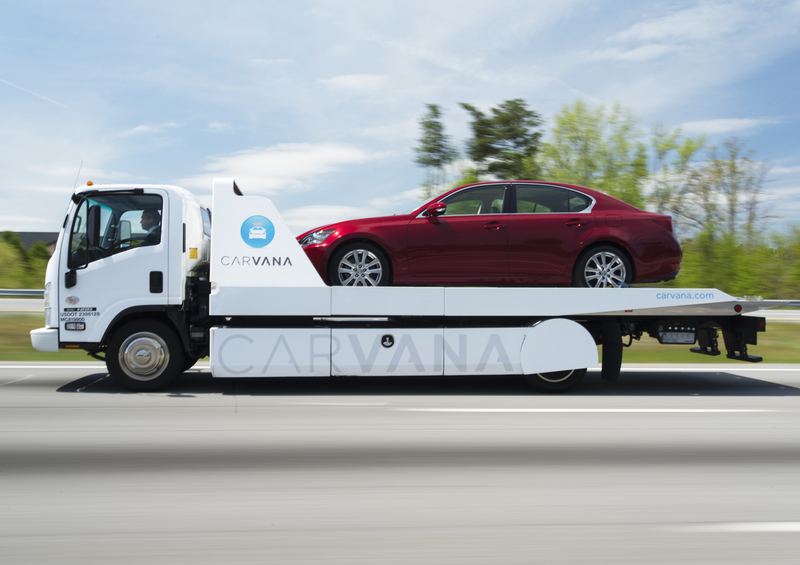 I want this to be a little more multi-purpose and still decent to drive on the streets. 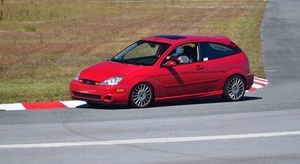 I've been wanting a car that I can take to the track/autocross/drag strip without being afraid of damaging it. I'm not a great driver by any means, so I can learn on this car without dying from too much horsepower. Sounds like it will be a fun car! Now to manically search craigslist for a sn-95 of my own. a set of 4 valve heads (B or C) and a blower will make 500+ hp easily on the stock block, OR get the trickl one with the Teksid aluminum block.its a bolt in,can use the stock wiring and computer,brakes,etc etc.easier than the coyote swap.modding the 2v is kind of a waste overall especially the old 96-98 non PI engines.like the one I have in my 96 GT.